The present invention relates to a high performance low cost video game system. More particularly, the invention relates to a video game system having a multifunctional player controller processing subsystem and a flexibly expandable video game external memory with a low pin out. Microprocessor-based home video game systems such as the Nintendo Entertainment System and the Super Nintendo Entertainment System have been highly successful in part because they can interactively produce exciting video graphics involving numerous animated moving objects. The video game system described herein permits game play involving three-dimensional images having a depth and realism far exceeding these and other heretofore known video game systems. In the past, computer systems required to produce such images interactively costs tens of thousands of dollars. In order to provide such a high performance video game system at a cost affordable to the average consumer, many features in the video game system were uniquely optimized. In so doing, many unique features were incorporated into the system described herein using novel, multifunctional components having a low pinout, but which provide for highly flexible future expansion. The processor and/or picture processing unit of video game systems such as the Nintendo Entertainment System and the Super Nintendo Entertainment System exercise direct control over processing of signals from player input/game control devices, i.e., player controllers. These prior art systems do not include a player controller processing subsystem which coacts with the game microprocessor and picture processing unit to process commands for handling player controller related input/output. Document EP 0 268 419 discloses a portable storage device attachable to a data processing unit of a video game system. The preamble of the independent claims is based on this document. The present invention is directed in part to a multifunctional peripheral processing subsystem external to the game microprocessor and disclosed coprocessor which executes commands for handling player controller input/output to thereby lessen the processing burden on the graphics processing subsystem. The peripheral processing subsystem is used for both controlling player controller input/output processing and for performing game authenticating security checks continuously during game play. The peripheral processing subsystem is also used during the game cartridge/video game system console initial communication protocol using instructions stored in its boot ROM to enable initial game play. The peripheral interface is coupled to the coprocessor by a three bit wide serial bus over which commands are received over one line, clock signals over another line and responses are transmitted to the coprocessor over a third serial line. The peripheral interface includes a microprocessor for controlling various peripheral interface functions, a read/write random access memory, a boot ROM, a coprocessor command channel interface, a player controller channel interface, etc., which components interact to efficiently process player controller commands while also performing other important functions without requiring significant main processor processing time. The coprocessor command channel interface responds to coprocessor clock and command control signals to permit access to the random access memory and to the boot ROM and generates control signals to interrupt the peripheral interface microprocessor. A peripheral interface macro may be executed to start a read or write transaction with each peripheral device and thereafter transfer the transaction results stored in the random access memory to the game microprocessor main memory. In accordance with another aspect of the present invention, a portable storage device is used in the form of a game cartridge in the exemplary embodiment having a low pinout due in part to the use of a multiplexed address/data bus. Memory access related timing signals are transmitted to the cartridge which may be programmably varied depending upon detected address domain which is used to establish the type of storage device being used by the video game system. Figures 6A-F show exemplary 3D screen effects achievable using the system described herein. Figure 1 shows an exemplary embodiment of a video game system 50 in accordance with the present invention. Illustrative video game system 50 includes a main console 52, a video game storage device 54, and handheld controllers 56a,b (or other user input devices). Main console 52 is connected to a conventional home color television set 58. Television set 58 displays 3D video game images on its television screen 60 and reproduces stereo sound through its speakers 62a,b. In the illustrative embodiment, the video game storage device 54 is in the form of a replaceable memory cartridge insertable into a slot 64 on a top surface 66 of console 52. A wide variety of alternative program storage media are contemplated by the present invention such as CD ROM, floppy disk, etc. In this exemplary embodiment, video game storage device 54 comprises a plastic housing 68 encasing a printed circuit board 70. Printed circuit board 70 has an edge 72 defining a number of electrical contacts 74. When the video game storage device 68 is inserted into main console slot 64, the cartridge electrical contacts 74 mate with corresponding "edge connector" electrical contacts within the main console. This action electrically connects the storage device printed circuit board 72 to the electronics within main console 52. In this example, at least a "read only memory" chip 76 is disposed on printed circuit board 70 within storage device housing 68. This "read only memory" chip 76 stores instructions and other information pertaining to a particular video game. The read only memory chip 76 for one game cartridge storage device 54 may, for example, contain instructions and other information for an adventure game while another storage device 54 may contain instructions and information to play a car race game, an educational game, etc. To play one game as opposed to another game, the user of video game system 60 need only plug the appropriate storage device 54 into main console slot 64 -- thereby connecting the storage device's read only memory chip 76 (and any other circuitry it may contain) to console 52. This enables a computer system embodied within console 52 to access the information contained within read only memory 76, which information controls the console computer system to play the appropriate video game by displaying images and reproducing sound on color television set 58 as specified under control of the read only memory game program information. To set up the video game system 50 for game play, the user first connects console 52 to color television set 58 by hooking a cable 78 between the two. Console 52 produces both "video" signals and "audio" signals for controlling color television set 58. The "video" signals control the images displayed on the television screen 60 and the "audio" signals are played back as sound through television loudspeaker 62. Depending on the type of color television set 58, it may be necessary to connect a conventional "RF modulator" between console 52 and color television set 58. This "RF modulator" (not shown) converts the direct video and audio outputs of console 52 into a broadcast type television signal (e.g., for a television channel 2 or 3) that can be received and processed using the television set's internal "tuner." Other conventional color television sets 58 have direct video and audio input jacks and therefore don't need this intermediary RF modulator. The user then needs to connect console 52 to a power source. This power source may comprise a conventional AC adapter (not shown) that plugs into a standard home electrical wall socket and converts the house voltage into a lower voltage DC signal suitable for powering console 52. The user may then connect up to 4 hand controllers 56a, 56b to corresponding connectors 80a-80d on main unit front panel 82. Controllers 56 may take a variety of forms. In this example, the controllers 56a,b include various function controlling push buttons such as 84a-c and X-Y switches 86a,b used, for example, to specify the direction (up, down, left or right) that a player controllable character displayed on television screen 60 should move. Other controller possibilities include joysticks, mice pointer controls and a wide range of other conventional user input devices. The present system has been designed to accommodate expansion to incorporate various types of peripheral devices yet to be specified. This is accomplished by incorporating a programmable peripheral device input/output system (to be described in detail below) which permits device type and status to be specified by program commands. In use, a user selects a storage device 54 containing a desired video game, and inserts that storage device into console slot 64 (thereby electrically connecting read only memory 76 and other cartridge electronics to the main console electronics). The user then operates a power switch 88 to turn on the video game system 50 and operates controllers 56a,b (depending on the particular video game being played, up to four controllers for four different players can be used with the illustrative console) to provide inputs to console 52 and thus control video game play. For example, depressing one of push buttons 84a-c may cause the game to start playing. Moving directional switch 86 may cause animated characters to move on the television screen 60 in controllably different directions. Depending upon the particular video game stored within the storage device 54, these various controls 84, 86 on the controller 56 can perform different functions at different times. If the user wants to restart game play from the beginning, or alternatively with certain game programs reset the game to a known continuation point, the user can press a reset button 90. Figure 2 is a block diagram of an illustrative embodiment of console 52 coupled to a game cartridge 54 and shows a main processor 100, a coprocessor 200, and main memory 300 which may include an expansion module 302. Main processor 100 is a computer that executes the video game program within storage device 54. In this example, the main processor 100 accesses this video game program through the coprocessor 200 over a communication path 102 between the main processor and the coprocessor 200, and over another communication path 104a,b between the coprocessor and the video game storage device 54. Alternatively, the main processor 100 can control the coprocessor 200 to copy the video game program from the video game storage device 54 into main memory 300 over path 106, and the main processor 100 can then access the video game program in main memory 300 via coprocessor 200 and paths 102, 106. Main processor 100 accepts inputs from game controllers 56 during the execution of the video game program. Main processor 100 generates, from time to time, lists of instructions for the coprocessor 200 to perform. Coprocessor 200, in this example, comprises a special purpose high performance, application specific integrated circuit having an internal design that is optimized for rapidly processing 3D graphics and digital audio information. In the illustrative embodiment, the coprocessor described herein is the product of a joint venture between Nintendo Company Limited and Silicon Graphics, Inc. The present invention is not limited to use with the above-identified coprocessor. Any compatible coprocessor which supports rapid processing of 3D graphics and digital audio may be used herein. In response to instruction lists provided by main processor 100 over path 102, coprocessor 200 generates video and audio outputs for application to color television set 58 based on data stored within main memory 300 and/or video game storage device 54. Figure 2 also shows that the audio video outputs of coprocessor 200 are not provided directly to television set 58 in this example, but are instead further processed by external electronics outside of the coprocessor. In particular, in this example, coprocessor 200 outputs its audio and video information in digital form, but conventional home color television sets 58 require analog audio and video signals. Therefore, the digital outputs of coprocessor 200 must be converted into analog form -- a function performed for the audio information by DAC and mixer amp 40 and for the video information by VDAC and encoder 144. The analog audio signals generated in DAC 140 are amplified and filtered by an audio amplifier therein that may also mix audio signals generated externally of console 52 via the EXTSOUND L/R signal from connector 154. The analog video signals generated in VDAC 144 are provided to a video encoder therein which may, for example, convert "RGB" inputs to composite video outputs compatible with commercial TV sets. The amplified stereo audio output of the amplifier in ADAC and mixer amp 140 and the composite video output of video DAC and encoder 144 are provided to directly control home color television set 58. The composite synchronization signal generated by the video digital to analog converter in component 144 is coupled to its video encoder and to external connector 154 for use, for example, by an optional light pen or photogun. Figure 2 also shows a clock generator 136 (which, for example, may be controlled by a crystal 148 shown in Figure 4A) that produces timing signals to time and synchronize the other console 52 components. Different console components require different clocking frequencies, and clock generator 136 provides suitable such clock frequency outputs (or frequencies from which suitable clock frequencies can be derived such as by dividing). In this illustrative embodiment, game controllers 56 are not connected directly to main processor 100, but instead are connected to console 52 through serial peripheral interface 138. Serial peripheral interface 138 demultiplexes serial data signals incoming from up to four or five game controllers 56 (e.g., 4 controllers from serial I/O bus 151 and 1 controller from connector 154) and provides this data in a predetermined format to main processor 100 via coprocessor 200. Serial peripheral interface 138 is bidirectional, i.e., it is capable of transmitting serial information specified by main processor 100 out of front panel connectors 80a-d in addition to receiving serial information from those front panel connectors. The serial interface 138 receives main memory RDRAM data, clock signals, commands and sends data/responses via a coprocessor serial interface (not shown). I/O commands are transmitted to the serial interface 138 for execution by its internal processor as will be described below. In this fashion, the peripheral interface's processor (250 in Figure 7) by handling I/O tasks, reduces the processing burden on main processor 100. As is described in more detail below in conjunction with Figure 7, serial peripheral interface 138 also includes a "boot ROM (read only memory)" that stores a small amount of initial program load (IPL) code. This IPL code stored within the peripheral interface boot ROM is executed by main processor 100 at time of startup and/or reset to allow the main processor to begin executing game program instructions 108 within storage device 54. The initial game program instructions 108 may, in turn, control main processor 100 to initialize the drivers and controllers it needs to access main memory 300. In this exemplary embodiment, serial peripheral interface 138 includes a processor (see 250 in Figure 7) which, in addition to performing the I/O tasks referred to above, also communicates with an associated security processor 152 within storage device 54. This pair of security processors (one in the storage device 54, the other in the console 52) performs, in cooperation with main processor 100, an authentication function to ensure that only authorized storage devices may be used with video game console 52. As shown in Figures 2 and 3A, peripheral interface 138 receives a power-on reset signal from reset IC 139. Reset IC 139 detects an appropriate threshold voltage level and thereafter generates a power-on reset signal which, in turn, results in a cold reset signal being generated by circuit 162, which signal is coupled to the reset input of main processor 100. In order to ensure that the cold reset signal is generated at the proper time, a delaying signal CLDCAP is coupled to cold reset signal generating circuit 162. Cold reset signal generator 162 includes a Schmidt trigger circuit (which receives the reset IC signal from reset IC 139) whose output is coupled to one input of an AND gate. The output of the Schmidt trigger is also coupled to a buffer inverter whose output and the CLDCAP signal are coupled to a second input of the AND gate. The output of the AND gate serves as the cold reset signal which is coupled to microprocessor 250 and main processor 100 and microprocessor 152 shown in Figure 3A. The cold reset signal generated by the cold reset signal generator is fed back to the input of generator 162 through a diode (not shown). The cold reset signal is also coupled to the reset input of the processor 250 embodied within the peripheral interface 138 (see Figure 7) and to the reset pin of connector 154 which is coupled to the reset input of security processor 152. Figure 3B shows the reset IC (RESIC), cold reset (CLDRES) and CLDCAP signals. Although signals shown in Figures 3B, 4A, 4B, etc. are referenced in the specification (and in Figures 2 and 3A) without regard to whether they are inverted or not (for ease of reference), Figures 3B, 4A and 4B and each of the timing diagrams in this disclosure indicate the appropriate inverted nature of the signal by a line over the signal (or pin) designation as is conventional. Figure 2 also shows a connector 154 within video game console 52. In this illustrative embodiment, connector 154 connects, in use, to the electrical contacts 74 at the edge 72 of storage device printed circuit board 70. Thus, connector 154 electrically connects coprocessor 200 to storage device ROM 76. Additionally, connector 154 connects the storage device security processor 152 to main unit serial peripheral interface 138. Although connector 154 in the particular example shown in Figure 2 may be used primarily to read data and instructions from a non-writable read only memory 76, system 52 is designed so that the connector is bidirectional, i.e., the main unit can send information to the storage device 54 for storage in random access memory 77 in addition to reading information from it. Main memory 300 stores the video game program in the form of CPU instructions 108. All accesses to main memory 300 are through coprocessor 200 over path 106. These CPU instructions are typically copied from the game program/data 108 stored in storage device 54 and downloaded to RDRAM 300. This architecture is likewise readily adaptable for use with CD ROM or other bulk media devices. Although CPU 100 is capable of executing instructions directly out of storage device ROM 76, the amount of time required to access each instruction from the ROM is much greater than the time required to access instructions from main memory 300. Therefore, main processor 100 typically copies the game program/data 108 from ROM 76 into main memory 300 on an as-needed basis in blocks, and accesses the main memory 300 in order to actually execute the instructions. Memory RD RAM 300 is preferably a fast access dynamic RAM capable of achieving 500 Mbytes/second access times such as the DRAM sold by RAMBUS, Inc. The memory 300 is coupled to coprocessor 200 via a unified nine bit wide bus 106, the control of which is arbitrated by coprocessor 200. The memory 300 is expandable by merely plugging, for example, an 8 Mbyte memory card into console 52 via a console memory expansion port (not shown). The main processor 100 preferably includes an internal cache memory (not shown) used to further decrease instruction access time. Storage device 54 also stores a database of graphics and sound data 112 needed to provide the graphics and sound of the particular video game. Main processor 100, in general, reads the graphics and sound data 112 from storage device 54 on an as-needed basis and stores it into main memory 300 in the form of texture data, sound data and graphics data. In this example, coprocessor 200 includes a display processor having an internal texture memory into which texture data is copied on an as-needed basis for use by the display processor. The storage device 54 also stores coprocessor microcode 156. In this example, a signal processor within coprocessor 200 executes a computer program in order to perform its various graphics and audio functions. This computer program, called the "microcode," is provided by storage device 54. Typically, main processor 100 copies the microcode 156 into main memory 300 at the time of system startup, and then controls the signal processor to copy parts of the microcode on an as-needed basis into an instruction memory within signal processor for execution. Because the microcode 156 is provided by storage device 54, different storage devices can provide different microcodes -- thereby tailoring the particular functions provided by coprocessor 200 under software control. Because the microcode 156 is typically too large to fit into the signal processor's internal instruction memory all at once, different microcode pages or portions may need to be loaded from main memory 300 into the signal processor's instruction memory as needed. For example, one part of the microcode 156 may be loaded into signal processor 400 for graphics processing, and another part of microcode may be loaded for audio processing. See the above-identified related application for further details relating to the signal processor, and display processor embodied within the coprocessor as well as the various data bases maintained in RD RAM 300. Although not shown in Figure 2, coprocessor 200 also includes a CPU interface, a serial interface, a parallel peripheral interface, an audio interface, a video interface, a main memory DRAM controller/interface, a main internal bus and timing control circuitry. The coprocessor main bus allows each of the various main components within coprocessor 200 to communicate with one another. The CPU interface is the gateway between main processor 100 and coprocessor 200. Main processor 100 reads data from and writes data to coprocessor CPU interface via a CPU-to-coprocessor bus. A coprocessor serial interface provides an interface between the serial peripheral interface 138 and coprocessor 200, while coprocessor parallel peripheral interface 206 interfaces with the storage device 54 or other parallel devices connected to connector 154. A coprocessor audio interface reads information from an audio buffer within main memory 300 and outputs it to audio DAC 140. Similarly, a coprocessor video interface reads information from an RDRAM frame buffer and then outputs it to video DAC 144. A coprocessor DRAM controller/interface is the gateway through which coprocessor 200 accesses main memory 300. The coprocessor timing circuitry receives clocking signals from clock generator 136 and distributes them (after appropriate dividing as necessary) to various other circuits within coprocessor 200. Main processor 100 in this example is a MIPS R4300 RISC microprocessor designed by MIPS Technologies, Inc., Mountain View, California. For more information on main processor 100, see, for example, Heinrich, MIPS Microprocessor R4000 User's Manual (MIPS Technologies, Inc., 1984, Second Ed.). The conventional R4300 main processor 100 supports six hardware interrupts, one internal (timer) interrupt, two software interrupts, and one non-maskable interrupt (NMI). In this example, three of the six hardware interrupt inputs (INTO, INT1 and INT2) and the non-maskable interrupt (NMI) input allow other portions of system 50 to interrupt the main processor. Specifically, main processor INTO is connected to allow coprocessor 200 to interrupt the main processor, the main processor interrupt INT1 is connected to allow storage device 54 or other external devices to interrupt the main processor, and main processor interrupts INT2 and NMI are connected to allow the serial peripheral interface 138 to interrupt the main processor. Any time the processor is interrupted, it looks at an internal interrupt register to determine the cause of the interrupt and then may respond in an appropriate manner (e.g., to read a status register or perform other appropriate action). All but the NMI interrupt input from serial peripheral interface 138 are maskable (i.e., the main processor 100 can selectively enable and disable them under software control). When the video game reset switch 90 is pressed, a non-maskable interrupt signal is generated by peripheral interface circuit 138 and is coupled to main processor 100 as shown in Figure 2. The NMI signal, however, results in non-maskable, immediate branching to a predefined initialization state. In order to permit the possibility of responding to reset switch 90 actuation by branching, for example, to the current highest game level progressed to, the circuit shown in Figure 3A is used. When the reset switch 90 is depressed, I/O port 164 receives a reset switch input signal which sets a logic circuit therein and immediately couples an INT2 signal to processor 100. INT2 is an NMI pre-warning signal and is used to, for example, trigger game processor 100 to save the state of the game in predetermined registers. The logic circuit within I/O port 164 may be a time delay circuit that ensures that the NMI signal occurs five seconds after INT2, as can be seen from the timing signals shown in Figure 3B. The left hand portion of Figure 3B shows the signal generation when the reset switch is pushed for less than one-half second. The right hand portion of Figure 3B shows the timing when the reset switch is pushed for greater than one-half second. Thus, an individual game program can designate a desired response to depressing the reset switch 90 by executing a predefined set of instructions in response to the INT2 signal before the occurrence of NMI. The CPU 100 also responds to the pre- NMI warning signal INT2 by initiating shut down processing for related audio and video systems and preparing for its cache memory and other circuits to shut down so that a return is possible to a desired known state other than merely the beginning of the game. The NMI signal is also coupled to the peripheral interface microprocessor 250. In operation, main processor 100 receives inputs from the game controllers 56 and executes the video game program provided by storage device 54 to provide game processing, animation and to assemble graphics and sound commands. The graphics and sound commands generated by main processor 100 are processed by coprocessor 200. In this example, the coprocessor performs 3D geometry transformation and lighting processing to generate graphics display commands which the coprocessor then uses to "draw" polygons for display purposes. As indicated above, coprocessor 200 includes a signal processor and a display processor. 3D geometry transformation and lighting is performed in this example by the signal processor and polygon rasterization and texturing is performed by display processor 500. Display processor writes its output into a frame buffer in main memory 300. This frame buffer stores a digital representation of the image to be displayed on the television screen 60. Further circuitry within coprocessor 200 reads the information contained in the frame buffer and outputs it to television 58 for display. Meanwhile, the signal processor also processes sound commands received from main processor 100 using digital audio signal processing techniques. The signal processor writes its digital audio output into main memory 300, with the main memory temporarily "buffering" (i.e., storing) the sound output. Other circuitry in coprocessor 200 reads this buffered sound data from main memory 300 and converts it into electrical audio signals (stereo, left and right) for application to and reproduction by television 58. More specifically, main processor 100 reads a video game program 108 stored in main memory 300. In response to executing this video game program 108, main processor 100 creates a list of commands for coprocessor 200. This command list, in general, includes two kinds of commands: graphics commands and audio commands. Graphics commands control the images coprocessor 200 generates on TV set 58. Audio commands specifying the sound coprocessor 200 causes to be reproduced on TV loudspeakers 62. The list of graphics commands may be called a "display list" because it controls the images coprocessor 200 displays on the TV screen 60. A list of audio commands may be called a "play list" because it controls the sounds that are played over loudspeaker 62. Generally, main processor 100 specifies both a display list and a play list for each "frame" of color television set 58 video. In this example, main processor 100 provides its display/play list 110 to coprocessor 200 by copying it into main memory 300. Main processor 100 also arranges for the main memory 300 to contain a graphics and audio database that includes all that the data coprocessor 200 needs to generate graphics and audio requested in the display/play list 110. For example, main processor 100 may copy the appropriate graphics and audio data from storage device read only memory 76 into the graphics and audio database within main memory 300. Main processor 100 tells coprocessor 200 where to find the display/play list 110 it has written into main memory 300, and that display/play list 110 may specify which portions of graphics and audio database 112 the coprocessor 200 should use. The coprocessor's signal processor reads the display/play list 110 from main memory 100 and processes this list (accessing additional data within the graphics and audio database as needed). The signal processor generates two main outputs: graphics display commands for further processing by display processor; and audio output data for temporary storage within main memory 300. Once signal processor 400 writes the audio output data into main memory 300, another part of the coprocessor 200 called an "audio interface" (not shown) reads this audio data and outputs it for reproduction by television loudspeaker 62. The signal processor can provide the graphics display commands directly to display processor over a path internal to coprocessor 200, or it may write those graphics display commands into main memory 300 for retrieval from the main memory by the display processor. These graphics display commands command display processor to draw ("render") specified geometric images on television screen 60. For example, display processor can draw lines, triangles or rectangles based on these graphics display commands, and may fill triangles and rectangles with particular textures (e.g., images of leaves of a tree or bricks of a brick wall such as shown in the exemplary screen displays in Figures 6A through F) stored within main memory 300 -- all as specified by the graphics display command. It is also possible for main processor 100 to write graphics display commands directly into main memory 300 so as to directly command the display processor. The coprocessor display processor generates, as output, a digitized representation of the image that is to appear on television screen 60. This digitized image, sometimes called a "bit map," is stored (along with "depth or Z" information) within a frame buffer residing in main memory 300 of each video frame displayed by color television set 58. Another part of coprocessor 200 called the "video interface" (not shown) reads the frame buffer and converts its contents into video signals for application to color television set 58. Each of Figures 6A-6F was generated using a three-dimensional model of a "world" that represents a castle on a hilltop. This model is made up of geometric shapes (i.e., lines, triangles, rectangles) and "textures" (digitally stored pictures) that are "mapped" onto the surfaces defined by the geometric shapes.. System 50 sizes, rotates and moves these geometric shapes appropriately, "projects" them, and puts them all together to provide a realistic image of the three-dimensional world from any arbitrary viewpoint. System 50 can do this interactively in real time response to a person's operation of game controllers 56. Figures 6A-6C and 6F show aerial views of the castle from four different viewpoints. Notice that each of the views is in perspective. System 50 can generate these views (and views in between) interactively with little or no discernible delay so it appears as if the video game player is actually flying over the castle. Figures 6D and 6E show views from the ground looking up at or near the castle main gate. System 50 can generate these views interactively in real time response to game controller inputs commanding the viewpoint to "land" in front of the castle, and commanding the "virtual viewer" (i.e., the imaginary person moving through the 3-D world through whose eyes the scenes are displayed) to face in different directions. Figure 6D shows an example of "texture mapping" in which a texture (picture) of a brick wall is mapped onto the castle walls to create a very realistic image. Figure 4A and 4B comprise an exemplary more detailed implementation of the Figure 2 block diagram. Components in Figures 4A and 4B, which are identical to those represented in Figure 2, are associated with identical numerical labels. Many of the components shown in Figures 4A and 4B have already been described in conjunction with Figure 2 and further discussion of these components is not necessary. Figures 4A and 4B show the interface between system components and the specific signals received on device pins in greater detail than shown in Figure 2. To the extent that voltage levels are indicated in Figures 4A and 4B, VDD represents +3.3 volts and VCC represents +5 volts. Focusing first on peripheral interface 138 in Figure 4B, signals such as CLDRES, NMI, RESIC, CLDCAP and RSWIN have been previously explained in conjunction with Figures 2, 3A and 3B which explanation will not be repeated herein. Three coprocessor 200/peripheral interface 138 communication signals are shown: PCHCLK, PCHCMD, and PCHRSP. These signals are transmitted on 3 bit wide peripheral interface channel bus as shown in Figures 2, 4A and 4B. The clock signal PCHCLK is used for timing purposes to trigger sampling of peripheral interface data and commands. The clock signal is transmitted from the coprocessor 200 to the peripheral interface 138. Coprocessor 200 and CPU 100, based on the video game program store in storage device 54, supply commands for the peripheral interface 138 to perform on the PCHCMD control line. The command includes a start bit field, a command code field and data or other information. The peripheral interface circuitry (as will be described further below) decodes the command and, if the data is ready in response to the command, sends a PCHRSP response signal comprising an acknowledge signal "ACK" followed by the response data. Approximately two clock pulses after the peripheral interface 138 generates the acknowledgment signal ACK, data transmission begins. Data received from the peripheral interface 138 may be information/instructions stored in the boot ROM or controller status or controller data, etc. Figure 5A shows representative signals transmitted across the PCHCLK, PCHCMD and PCHRSP lines. The relationships between the clock signal and the peripheral interface sampling of the PCHCMD line and the clock signal and the peripheral interface outputting of the response is shown in Figure 5A. Additionally, the relationships between the clock signal and coprocessor 200 (RCP) outputting a PCHCMD and the coprocessor sampling the PCHRSP is shown in Figure 5A. As suggested by Figure 5A, the high and low levels of the clock signal may have different pulse widths dependent upon whether the system is to be utilized with NTSC or PAL. Figure 5B shows exemplary signals appearing on the peripheral interface channel for four exemplary commands serving to read 4 bytes into memory, write 4 bytes into memory, execute a peripheral interface macro instruction or write 64 bytes into peripheral interface buffer memory. Further explanation of the peripheral interface device and these commands will be described in detail below. Turning back to the Figure 4B peripheral interface 138, SECCLK, SECTRC and SECTRD are three security related signals coupled between two security processors embodied within the peripheral interface 138 and game cartridge, respectively. SECCLK is a clock signal used to clock security processor operations in both the peripheral interface and the game cartridge. SECTRC is a signal sent from the peripheral interface 138 to the game cartridge defining a data transmission clock signal window in which data is valid and SECTRD is a data transmission bus signal in which data from the peripheral interface 138 and data from the game cartridge security processor are exchanged at times identified by the SECTRD transmission clock pulses. Finally, the peripheral interface 138 includes a pin RSWIN which is the reset switch input pin. Turning next to connector 154, as previously mentioned, the system 50 includes an expansion capability for adding another controller 56. Data from such a controller would be transmitted via the EXTJOY I/O pin of the connector 154. The three above-mentioned security related signals are coupled between the game cartridge security processor and peripheral interface processor at the pins labeled SECTRD, SECTRC and SECCLK. The cartridge connector additionally couples a cold reset signal CRESET to the game cartridge security processor to enable a power on reset function. Additionally, if during processor authentication checking, if, for example, the peripheral interface processor does not receive data which matches what is expected, the cartridge processor may be placed in a reset state via the CRESET control pin. The NMI input is a control pin for coupling an NMI interrupt signal to the cartridge. The control line CARTINT is provided to permit an interrupt signal to be generated from the cartridge to CPU 100 to, for example, if devices are coupled to the cartridge requiring service by CPU 100. By way of example only, a bulk storage device such as a CD ROM is one possible device requiring CPU interrupt service. As shown in Figure 4B, the system bus is coupled to the cartridge connector 154 to permit accessing of program instructions and data from the game cartridge ROM and/or bulk storage devices such as CD ROM, etc. In contrast with prior video game systems such as the Nintendo NES and SNES, address and data signals are not separately coupled on different buses to the game cartridge but rather are multiplexed on an address/data 16 bit wide bus. Read and write control signals and address latch enable high and low signals, ALEH and ALEL, respectively are also coupled to the game cartridge. The state of the ALEH and ALEL signals defines the significance of the information transmitted on the 16 bit bus. The read signal RD is a read strobe signal enabling data to be read from the mask ROM or RAM in the game cartridge. The write signal WR is a strobe signal enabling the writing of data from the coprocessor 200 to the cartridge static RAM or bulk media device. The multiplexed use of the 16 bit address/data bus is described in further detail in conjunction with Figures 12-14 in describing external memory accessing. Sound may be output from the cartridge and/or through connector 154 to the audio mixer 142 channel 1 and channel 2 inputs, CH1EXT and CH2EXT, respectively. The external sound inputs from SOUNDL and SOUNDR will be mixed with the sound output from the coprocessor via the audio DAC 140 and the CH1IN, CH2IN inputs to thereafter output the combined sound signal via the audio mixer outputs CH1OUT, CH2OUT which are, in turn, coupled to the AUDIOL and AUDIOR inputs of the audio video output connector 149 and thereafter coupled to the TV speakers 62a,b. The connector 154 also receives a composite sync signal CSYNC which is the output of video DAC 144 which is likewise coupled to the audio video output connector 149. The composite sync signal CSYNC, as previously described, is utilized as a synchronization signal for use in synchronizing, for example, a light pen or photogun. The cartridge connector also includes pins for receiving power supply and ground signals as shown in Figures 4B. The +3.3 volts drives, for example, the 16 bit AD bus as well as other cartridge devices. The 12 volt power supply connection is utilized for driving bulk media devices. Turning to coprocessor 200 in Figure 4A, many of the signals received or transmitted by coprocessor 200 have already been described, which will not be repeated herein. The coprocessor 200 outputs an audio signal indicating whether audio data is for the left or right channel, i.e., AUDLRCLK. Serial audio data is output on a AUDDATA pin. Timing for the serially transmitted data is provided at the AUDCLK pin. Coprocessor 200 outputs seven video signals SRGBO through SRGB7 which synchronized RGB digital signals are coupled to video DAC 144 for conversion to analog. Coprocessor 200 generates a timing signal SYNC that controls the timing for the SRGB data which is coupled to the TSYNC input of video DAC 144. Coprocessor 200 receives a video clock input from clock generator 136 via the VCLK input pin for controlling the SRGB signal timing. The coprocessor 200 and CPU 100 use a PVALID SIGNAL to indicate that the processor 100 is driving a valid command or data identifier or valid address/data on the system bus and an EVALID signal to indicate that the coprocessor 200 is driving a valid command or data identifier or valid address/data on the system bus. Coprocessor 200 supplies CPU 100 with master clock pulses for timing operations within the CPU 100. Coprocessor 200 and CPU 100 additionally use an EOK signal for indicating that the coprocessor 200 is capable of accepting a processor 100 command. Turning to main memory RDRAM 300, 302, as depicted in Figure 4A, two RDRAM chips 300a and 300b are shown with an expansion RDRAM module 302. As previously described, the main memory RDRAM may be expanded by plugging in a memory module into a memory expansion port in the video console housing. Each RDRAM module 300a,b, 302 is coupled to coprocessor 200 in the same manner. Upon power-up RDRAM 1 (300a) is first initialized, then RDRAM2 (300b) and RDRAM3 (302) are initialized. RDRAM 1 is recognized by coprocessor 200 since its SIN input is tied to VDD, as shown in Figure 4A. When RD1 is initialized under software control SOUT will be at a high level. The SOUT high level signal is coupled to SIN of RDRAM 2 (300b) which operates to initialize RDRAM2. SOUT will then go to a high level which operates to initialize RDRAM3 (302) (if present in the system). Each of the RDRAM modules receives bus control and bus enable signals from coprocessor 200. The coprocessor 200 outputs a TXCLK signal when data is to be output to one of RDRAM1 through 3 and a clock signal RXCLK is output when data is to be read out from one of the RDRAM banks. The serial in (SIN) and serial out (SOUT) pins are used during initialization, as previously described. RDRAM receives clock signals from the clock generator 136 output pin FSO. Clock generator 136 is a three frequency clock signal generator. By way of example, the oscillator within clock generator 136 may be a phase-locked locked loop based oscillator which generates an FSO signal of approximately 250MHz. The oscillator also outputs a divided version of the FSO signal, e.g., FSO/5 which may be at approximately 50 MHz, which is used for timing operations involving the coprocessor 200 and video DAC 144, as is indicated in Figures 4A and 4B. The FSC signal is utilized for timing the video encoder carrier signal. Clock generator 136 also includes a frequency select input in which frequencies may be selected depending upon whether an NTSC or PAL version of the described exemplary embodiment is used. Although the FSEL select signal is contemplated to be utilized for configuring the oscillator for NTSC or PAL use, as shown in Figure 4A, the input resets the oscillator under power-on reset conditions. When connected to the power on reset, the oscillator reset is released when a predetermined threshold voltage is reached. Figure 7 is a block diagram of peripheral interface 138 shown in Figure 2. The portion of peripheral interface 138 previously described in conjunction with Figures 3A and 3B is not shown in Figure 7. Peripheral interface 138 is utilized for I/O processing, e.g., controlling the game controller 56 input/output processing, and for performing game authenticating security checks continuously during game play. Additionally, peripheral interface 138 is utilized during the game cartridge/coprocessor 200 communication protocol using instructions stored in boot ROM 262 to enable initial game play. Peripheral interface 138 includes CPU 250, which may, for example, be a 4 bit microprocessor of the type manufactured by Sharp Corporation. CPU 250 executes its security program out of program ROM 252. As previously described, the peripheral interface processor 250 communicates with the security processor 152 embodied on the game cartridge utilizing the SECTRC, SECTRD and SECCLK signals. Peripheral interface port 254 includes two 1 bit registers for temporarily storing the SECTRC and SECTRD signals. Overall system security for authenticating game software is controlled by the interaction of main processor 100, peripheral interface processor 250, boot ROM 262 and cartridge security processor 152. Boot ROM 262 stores a set of instructions executed by processor 100 shortly after power is turned on (and, if desired, upon the depression of reset switch 90). The boot ROM program includes instructions for initializing the CPU 100 and coprocessor 200 via a set of initial program loading instructions (IPL). Authentication calculations are thereafter performed by the main processor 100 and the result is returned to the CPU 250 in peripheral interface 138 for verification. If there is verification, the game program is transferred to the RDRAM, after it has been initialized, and a further authentication check is made. Upon verification of an authentic game program, control jumps to the game program in RDRAM for execution. Continuous authentication calculations continue during game play by the authenticating processor in the peripheral interface 138 and by security processor 152 such as is described, for example, in U.S. Patent 4,799,635 and related U.S. Patent 5,426,762. Turning back to Figure 7, a PCHCLK clock signal having a frequency of, for example, approximately 15MHz is input to clock generator 256 which, in turn, supplies an approximately 1MHz clocking signal to CPU 250 and an approximately 1MHz clock signal along the line SECCLK for transmission to the game cartridge security processor 152. PIF channel interface 260 responds to PCHCLK and PCHCMD control signals to permit access of the boot ROM 262 and RAM 264 and to generate signals for controlling the interruption of CPU 250, when appropriate. Figure 8 is a block diagram of the PIF channel interface 260 shown in Figure 7. As shown in Figure 8, commands are serially loaded into shift register 282 on line PCHCMD under the control of clock pulses PCHCLK. Shift register 282 operates as a serial to parallel converter and a parallel to serial converter as explained below. Controller 284 decodes commands which are output in parallel from shift register 282 to, for example, generate read or write control signals for accessing information from RAM 264, reading instructions out of boot ROM 262 or to generate interrupt control signals to be communicated to CPU 250 and/or generates other conventional control signals (CTL) as needed. Information accessed from RAM 264 and instructions accessed from boot ROM 262 are loaded via internal bus 285 in parallel to shift register 282 and then are clocked out of shift register 282 serially on the response line PCHRSP. If the command loaded into shift register 282 is a write to RAM 264 command, controller 284 will decode the command, generate a write control signal and output data associated with the command in parallel from the shift register to RAM 264. Thus, controller 284 exercises DMA control in controlling accessing of RAM 264 and boot ROM 262 data, and loading such data in shift register 282 and in controlling data transfer from shift register 282 to RAM 264. PIF channel interface 260 _ also includes a buffer control/status register 283 for storing channel status and/or control bits which may be accessed by controller 284 or CPU 250. This register stores information indicative of current buffer 264 access size and buffer 264 read/write status. As shown in Figure 5A, the PCHCLK signal is the basic clock signal which may, for example, be a 15.2 MHz signal utilized for clocking communication operations between the coprocessor 200 and the peripheral interface 138. Figure 5A also shows the timing for the PCHCMD command issued by the coprocessor 200 to the peripheral interface 138. The command is utilized for reading and writing from and to RAM 264 and for reading from boot ROM 262. The peripheral interface 138 in turn provides a PCHRSP response which includes both accessed data and an acknowledgment signal. The lower three timing signals shown in Figure 5A are signals from the perspective of the peripheral interface (PIF) whereas the upper three timing signals are from the perspective of the coprocessor. In the present exemplary embodiment, four commands are contemplated including a read 4 byte from memory command for reading from RAM 264 and boot ROM 262, a write 4 byte memory command for writing to RAM 264, a PIF macro command for reading 64 bytes from buffer 264 and accessing control/data from the player controller (hereinafter JoyChannel). The CPU 250 is triggered to send or receive JoyChannel data by the PIF macro instruction. The main processor 100 may thus generate a PIF macro command which will initiate I/O processing operations by CPU 250 to lessen the processing burden on main processor 100. The main processor 100 may also issue a write 64 byte buffer command which writes 64 bytes into RAM 264. Turning back to Figure 7, peripheral interface 138 also includes a bus arbitrator 258 which allocates access to RAM 264 between CPU 250 and PIF channel interface 260. RAM 264 operates as a working RAM for CPU 250 and stores cartridge authenticating related calculations. RAM 264 additionally stores status data such as, for example, indicating whether the reset switch has been depressed. RAM 264 also stores controller related information in, for example, a 64 byte buffer within RAM 264. 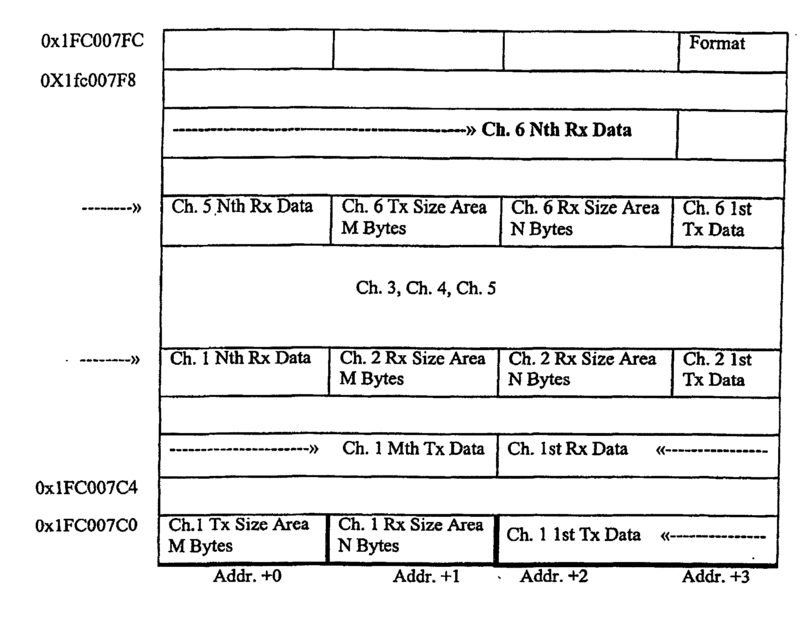 Figure 5B shows exemplary command formats for reading and writing from and to the 64 byte buffer. Both the buffer RAM 264 and the boot ROM 262 are in the address space of main processor 100. The CPU 250 of the peripheral interface 138 also can access buffer RAM 264 in its address space. Memory protection techniques are utilized in order to prevent inappropriate access to portions of RAM 264 which are used for authenticating calculations. As can be seen in Figure 7, the reset and interrupt related signals shown in Figures 3A and 3B, such as CLDRES, CLDCAP and RESIC are generated and/or processed as explained above. The signal RSWIN is coupled to port 268 upon the depression of reset switch 90 and, as explained above, the NMI and the pre-NMI warning signal, INT2, are generated as previously described in conjunction with Figure 3B. Port 268 includes a reset control register storing bits indicating whether an NMI or INT2 signal is to be generated. A third bit in the reset control register indicates whether the reset switch 90 has been depressed. As mentioned previously, peripheral interface 138, in addition to its other functions, serves to provide input/output processing for two or more player controllers. As shown in Figure 1, an exemplary embodiment of the present invention includes four sockets 80a-d to accept up to four peripheral devices. Additionally, the present invention provides for including one or more additional peripheral devices. See connector 154 and pin EXTJOY I/O. The 64 bit main processor 100 does not directly control peripheral devices such as joystick or cross-switch based controllers. Instead, main processor 100 controls the player controllers indirectly by sending commands via coprocessor 200 to peripheral interface 138 which handles I/O processing for the main processor 100. As shown in Figure 7, peripheral interface 138 also receives inputs from, for example, five player controller channels via channel selector 280, demodulator 278, joystick channel controller 272 and port 266. Joystick channel data may be transmitted to peripheral devices via port 266 to joystick channel controller 272, modulator 274 and channel select 276. With respect to JoyChannel communication protocol, there is a command protocol and a response protocol. After a command frame, there is a completion signal generated. A response frame always comes after a command frame. In a response frame, there is a completion signal generated after the response is complete. Data is also sent from the peripheral interface 138 to the JoyChannel controllers. The CPU 250 of the peripheral interface controls such communications. Each channel coupled to a player controller is a serial bilateral bus which may be selected via the channel selector 276 to couple information to one of the peripheral devices under the control of the four bit CPU 250. If the main processor 100 wants to read or write data from or to player controllers or other peripheral devices, it has to access RAM 264. There are several modes for accessing RAM 264 as shown in Figure 5B. The 64 bit CPU 100 may execute a 32 bit word read or write instruction from or to the peripheral interface RAM 264. Alternatively, the CPU may execute a write 64 byte DMA instruction. This instruction is performed by first writing a DMA starting address into the main RAM address register. Thereafter, a buffer RAM 264 address code is written into a predetermined register to trigger a 64 byte DMA write operation to transfer data from a main RAM address register to a fixed destination address in RAM 264. A PIF macro also may be executed. A PIF macro involves an exchange of data between the peripheral interface RAM 264 and the peripheral devices and the reading of 64 bytes by DMA. By using the PIF macro, any peripheral device's status may be determined. The macro is initiated by first setting the peripheral interface 138 to assign each peripheral device by using a write 64 byte DMA operation or a write 4 byte operation (which could be skipped if done before and no change in assignment is needed). Thereafter, the DMA destination address is written onto a main RAM address register and a predetermined RAM 264 address code is written in a PIF macro register located in the coprocessor which triggers the PIF macro. The PIF macro involves two phases where first, the peripheral interface 138 starts a reading or writing transaction with each peripheral device at each assigned mode which results in updated information being stored in the peripheral interface RAM 264. Thereafter, a read 64 byte DMA operation is performed for transferring 64 bytes from the fixed DMA starting address of the RAM 264 to the main RAM address register programmable DMA destination address within main RAM 300. See Figure 5B for PIF macro timing signals. The table below exemplifies the manner in which the 64 bit main processor 100 communicates using its memory address space by addressing RAM 264 to exchange information with the JoyChannels. There are six JoyChannels available in the present exemplary embodiment. Each Channel's transmit data and receive data byte sizes are all independently assignable by setting size parameters. In the exemplary embodiment, all six channels size parameter setups are required, whether they are used or not. As shown above, RAM 264 is to be used for each channel's TxData/RxData assignment. TxData/RxData assignment becomes effective when main processor 100 sets a format flag (0x1FC007FC b0) by using Wr64B or Wr4B. In the exemplary embodiment, if processor 100 writes "0x00", "0xFD" "0xFE" or "0xFF" as TxData Size, the data is not recognized as TxData size but has a special function as indicated below. They become effective when processor 100 sets format bit (0x1FC007FC b0) by using Wr64B or Wr4B. If 0x00 is written as TxData Size, respective JoyChannel transaction is not executed. If 0xFD is written as TxData Size, PIF outputs reset signal to respective JoyChannel. If 0xFE is written as TxData Size, TxData/RxData assignment is terminated at this "0xFE". In other words, the TxData Size or RxData Size after "0xFE" is ignored. TxData Size's 0xFF is used as the dummy data for word aligning the data area. Each Channel has four flags. Two of them have information from processor 100 to JoyChannel and others from JoyChannel to processor 100. If processor 100 sets this flag to "1", respective JoyChannel transaction is not executed. This flag becomes effective without format flag. If 64 bit CPU set this flag to "1", PIF outputs reset signal to respective JoyChannel. This flag becomes effective without format flag. When each JoyChannel's peripheral device does not respond, the respective NR bit is set to "1". This is the way to detect the number of currently connected peripheral devices. When communication error has occurred between PIF and peripheral device, Err flag is set to "1". If the 64 bit CPU 100 wants to change JoyChannel's Tx/RxData assignment, a 32 bit format flag is used, where a certain bit(s) specify the desired format. 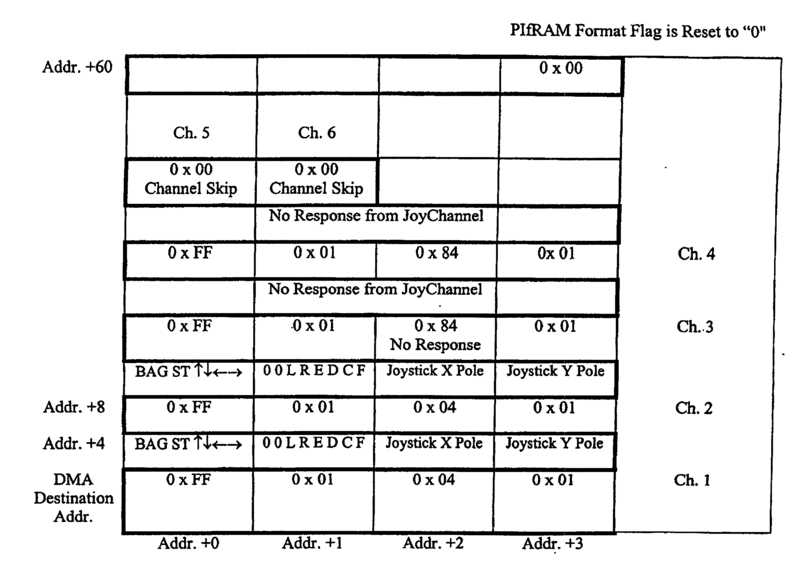 For example, when Wr64B or Wr4B is issued when this flag is "1", PIF executes each JoyChannel's Tx/RxData assignment based on each channel's Tx/Rx Size. In other words, unless this flag is set to "1" with Wr64B or Wr4B, Tx/RxData area assignment does not change. After Tx/RxData assignment, this flag is reset to "0" automatically. Figure 9A is a block diagram of the joystick channel controller 272 and port 266 shown in Figure 7. As indicated in Figure 9A, bus 287 which is coupled to CPU 250 couples data to be transmitted to JoyChannel through port register 290 to FIFO buffer 312. Under the control of controller 310, four bit data is then loaded into shift register 314 in parallel and serially clocked out to modulator 274 into an identified JoyChannel selected by channel select 276 based on an address resident in address register RA299. Data received from a JoyChannel is input via channel selector 280 to demodulator 278 and then is serially loaded into shift register 314. The serial data is converted to parallel by shift register 314, loaded into FIFO 312 and then coupled to CPU 250 via register 292. Controller 310 generates conventional control signals (CTL) used to control the data exchange described herein. The function of the various port 266 registers are summarized below. Register RO(290) is a JoyChannel output register for receiving data to be output via modulator 274 and channel select 276. Joystick Channel controller 272 uses a JoyChannel address register RA to control the channel select to identify particular JoyChannels for input and output of data. Register R1 292 is a four bit JoyChannel input data register. Register CR 294 is a JoyChannel control register which, for example, identifies whether data is being received or transmitted. Register SR 296 is a JoyChannel status register which, for example, includes a bit indicating that a Joy Bus data register is ready and that a bit indicating that a Joy Bus error has been detected. Register ER 298 is a Joy Bus error register that indicates whether there has been a collision error, frame error, overrun error or no response error. With respect to the no response signal, even if a controller is not connected and therefore could not give a response, the lack of response is treated as an error signal in the exemplary embodiment of the present invention. As can be seen in Figure 9A, controller 310 supplies the status register and the error register with the status and error information identified above in parallel and receives control signals from control register 294 for controlling buffer 312 and shift register 314 to respond according to the current mode of operation. Thereafter, the DMA start address is written in a RDRAM coprocessor 200 address register. A RAM 264 address code is then written into the write 64 byte register in the coprocessor 200 and a write DMA destination address is written in the RDRAM address register in the coprocessor. Thereafter, the address in the 64 byte RAM 264 is written in the PIF macro register in the coprocessor. The controllers response is returned to RDRAM. If only two controllers are connected to channel 1 and channel 2, DMA destination RAM area resulting therefrom after the PIF macro is executed is preferably as shown below. However, if a controller is connected to channel 3 or channel 4, the channel's RAM area changes to the same as channel 1 or channel 2. The peripheral device channel is designed to accept various types of future peripheral devices. The present exemplary embodiment uses an extensible command which is to be interpreted by peripherals including future devices. The commands occupy the first byte of a TxData area in RAM 264. Many bits and commands are reserved for future extension. Exemplary commands relating to peripheral devices are shown below. Commands are also provided for read and writing data to a memory card. Backup data for a game may be stored on a memory card. In this fashion, no backup battery need be used for this memory during game play since it plugs into the controller. Certain of these commands contemplate an expansion memory card module 313 that plugs into a player controller 56 as is shown in Figure 11. For further details relating to exemplary controllers that may be used in system 50 and the communications protocol between such controller and the peripheral interface 138 (and processing associated therewith) reference is made to a Japanese patent application filed October 9, 1995 and published with publication no. 7-288006 naming Nishiumi et al as inventors. Exemplary controller commands are shown below. This command is used to ask the peripheral device's type and status flags, and its answer is supposed to be returned into RX data area. This type is provided from the connected peripheral device about its functions and features as shown for example below. L b0: In the case of the standard controllers, they would send a "1" response which indicates that controllers contain counters and send the joystick data as the absolute value. L b2: In the case of the standard controllers, they would send a "1" response which indicates that controllers have the JoyPort which connects to the exchangeable memory card shown in Figure 11. These status flags are the response from the connected peripheral device about its status. In the case of standard controllers, these flags are used for memory card. b0: If memory card is connected to controller, this flag is set to "1". If not, this flag is set to "0". b1: After a controller is plugged in, if memory card is pulled out, this flag is set to "1". This flag is reset to "0" when controller plugged and power supplied, or command 0 or 255 (controller software reset command) issued with memory card connected. If controller is plugged and power supplied without memory card, this flag is indefinite. b2: AddrCRC (cyclic redundancy code) report is sent from the controller in communicating with JoyPort. This flag status "1" means that Address H/L are not transferred to the controller correctly. This flag is reset to "0", when peripheral device plugged and power supplied or command 0 or 255 issued. Command 1 is used for getting controller's button condition and Joystick condition. Joystick's counter is reset to "0x00" when controller is plugged in and power is supplied, command 0 or 255 issued, JoyChannel reset issued or L, R, START buttons pushed at the same time. JSRes bit shows that L, R, START buttons are pushed at the same time. Turning back to Figure 7, the JoyChannels do not require two separate lines for clock and data signals, respectively. Instead, JoyChannel data is transmitted to represent 1's and 0's as shown in Figure 9B. In this fashion, only power line, ground and data transmitted as shown in Figure 9B are required. Thus, as shown in Figure 9B, pulse duty modulation is utilized to represent 1's and 0's. By sampling the data at the middle of the clocking signal whether the data represents a 1 or 0 is determined. The flow charts in Figures 10A through 10C depict the sequence of operations involved in sending and receiving data between port 266 shown in Figure 9A and the JoyChannels shown in Figure 7. A routine for sending and receiving data is shown in which the channel mode is set (315). A send counter is set to the desired value (317). A check is then made, as indicated at block 319, to determine if the send counter is equal to zero. If the send counter is equal to zero, then the port is set to receive mode (321). Thereafter, the receive counter is set (323). A check is then made to determine if the receive counter is zero (325). If the receive counter is zero, then the port is set to send mode (327), after which return is made to the calling routine being executed by CPU 250. If, at block 319, a determination was made that the send counter is not equal to zero, then the routine branches to a send-a-byte of data sub-routine (331). As indicated in Figure 10B, in accordance with the send-a-byte of data routine, a check is made to determine whether the port ready flag is on (338). If the port ready flag is not on, the routine cycles until the port ready flag is on. When the port ready flag is on, then a byte of data is sent from memory to the port (339) and the routine branches to the calling routine in block 331 in Figure 10A. After a byte of data has been sent, the send counter is decremented (333) and the routine branches back to block 319. Once the send counter is equal to zero, the receive mode is entered as previously described. If the check at block 325 indicates that the receive counter is not equal to zero, then the routine branches to a receive-a-byte of data subroutine (335) shown in Figure 10C. In accordance with the receive-a-byte of data routine (335), a check is made to determine whether the port ready flag is on (341). If the port ready flag is not on, then the routine cycles until the port ready flag is turned on. Thereafter, a byte of data from the port is sent to the memory (342) and the routine branches to the calling routine (343) at block 335. After a byte of data has been received, the receive counter is decremented (337) and the routine branches back to block 325. Figure 12 is a block diagram which demonstrates in detail how the address/data 16 bit bus is utilized to read information from a game cartridge ROM and read and write information from a game cartridge RAM. Coprocessor 200 generates an address latch enable high signal which is input to the ALEH pin in Figure 12. Exemplary timing signals for the reading and writing of information are shown in Figures 13 and 14 respectively. The coprocessor 200 similarly generates an address latch enable low signal (shown in Figure 13) which is coupled to the ALEL pin which, in turn, enables information on address pin 0 to 15 to be loaded into the input buffer 352. Bits 7 and 8 and 11 and 12 from input buffer 352 are, in turn, coupled to address decoder 356. In the exemplary embodiment of the present invention, bits 7, 8 and 11, 12 are decoded by the address decoder to ensure that they correspond to 4 bits indicative of the proper location in the address space for the mask ROM 368. Thus, the mask ROM 368 has a designated location in the AD16 bus memory map and decoder 356 ensures that the mask ROM addressing signals correspond to the proper mask ROM location in this memory map. Upon detecting such correspondence, decoder 356 outputs a signal to one-bit chip select register 360. Turning to Figure 13, when ALEH transitions from high to low, as shown in Figure 12, bits 0 to 6 output from input buffer 352 are latched into 7 bit address register 362. Simultaneously, data from address decoder 356 is latched into chip select register 360 and register 358 is also enabled, as indicated in Figure 12. When the coprocessor 200 outputs low order address bits on the AD16 bus, the address signals are input to input buffer 352. The bits are coupled in multiple directions. As indicated in Figure 12, bits 1 to 8 are set in an 8 bit address presettable counter 366 and bits 9 to 15 are coupled to 7 bit address register 364. At a time controlled by ALEL (shown in Figure 13), when registers 358 and 360 are set and registers 362, 364 and 366 are loaded, the read out of data is ready to be initiated. As indicated in Figure 13, the time TL is required for data to be output after the ALEL signal transitions from high to low. After the ALEL signal has been generated, a read pulse RD is applied on the pin shown in the top lefthand portion of Figure 12. The read signal is input to gate 374 whose other input is coupled to gate 372. When the output of registers 358, 360 and signals ALEL and ALEH are low, then the output of 372 will be low. When RD and the output of 372 are low, the clock signal is generated at the output of 374 thereby causing the counter 366 to be clocked and begin counting and the output buffer 354 to be enabled. The 8 bit address presettable counter determines the memory cell array column selected and the combination of the output of address register 362 and address register 364 defines the memory cell row selected. The output data is temporarily stored in latch 370 and then coupled to output buffer 354. Thereafter, the data is transmitted back to coprocessor 200 via the same 16AD 0 to 15 lines. By virtue of using the multiplexed AD 0 to 15 bus, the game cartridge pin out is advantageously reduced. The circuitry of Figure 12, although designed for accessing a mask ROM, is readily adaptable for writing information into, for example, static RAM using the timing signals shown in Figure 14. In a static RAM embodiment, the processing of the ALEH and ALEL signals are the same as previously described as is the loading of information in the registers 358, 360, 362, 364 and 366. A write signal, such as shown in Figure 14 is generated and coupled to gate 374 instead of the read signal shown in Figure 12. Data is output from coprocessor 200 for writing into a static RAM memory 368. The data is loaded into buffer 352. A clock pulse is generated at the output of gate 374 to cause the address presettable counter to begin counting to cause data to be written into memory 368 rather than read out as previously described. Tables 1 through 3 below show the signals used in Figure 12 and explain the timing symbols utilized in the read and write timing charts shown in Figures 13 and 14. The times indicated in Tables 2 and 3 are for purposes of illustration only. As shown in Figure 2, the AD16 bus may be used to address devices other than ROM. 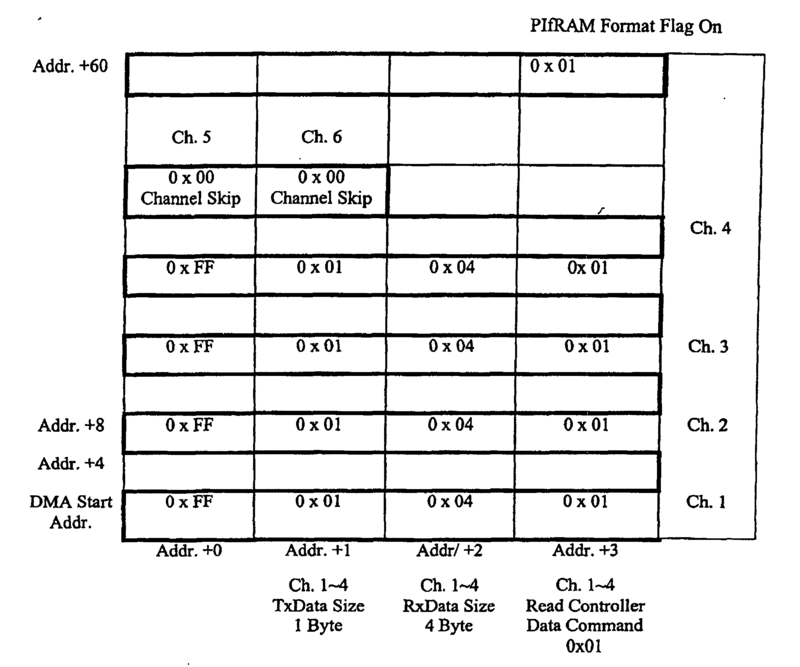 For example, Figure 2 shows a read/write RAM which may be accessed by the video game system 50 through connector 154. By way of example only, ROM may occupy address domain 1 in the processor 100 memory space. In accordance with the present invention, a memory device having a different address domain may have different timing parameters. Depending upon the detected address domain, e.g., 1 or 2, the AD 16 bus couples signals having different timing characteristics to connector 154. By detecting, for example, whether address domain 1 or 2 is being accessed, the coprocessor 200 may select one of two sets of timing signals to couple to connected 154 and the AD 16 bus system. In this fashion, a game program can configure the video game system 50 to generate timing signals tailored to the memory media for which the game has been designed. Table 3 also shows an exemplary set of programmable parameters within a given address space, e.g., address domain 1. The concurrently filed copending application shows further details concerning the coprocessor registers involved in programming the AD 16 bus in accordance with address domain as described above. the video game instructions within the portable storage device (54) include at least one player controller instruction for causing the game program executing processing system to send a command (PCHCMD) to the player controller processor subsystem (138) execution of which initiates an operation relating to the player-generated video game control signals. A portable storage device (54) in accordance with claim 1, wherein said command (PCHCMD) is a multi-byte read command. A portable storage device (54) in accordance with claim 1, wherein said command (PCHCMD) is a multi-byte write command. A portable storage device (54) in accordance with claim 2, wherein said player controller processor subsystem (138) includes a random access memory (264) for storing player controller related data, and wherein said multi-byte read command is used to read from said random access memory (264). A portable storage device (54) in accordance with claim 2, wherein said player controller processor subsystem (138) includes a boot ROM (262) and wherein said multi-byte read command is used to read from said boot ROM (262). A portable storage device in accordance with claim 1 wherein the command (PCHCMD) causes the player controller processor subsystem (138) 1) to initiate a data transaction between the player controller processor subsystem (138) and at least one player controller (56) and 2) to forward player-generated video game control signals to the coprocessor (200). means for transmitting a response (PCHRSP) to said player controller command to the coprocessor (200). A peripheral processing subsystem according to claim 7, further including a random access memory (264) for storing player controller related data received from the at least one player controller (56). A peripheral processing subsystem (138) according to claim 8, wherein the first interface circuit (260) includes a shift register (282) for receiving the player controller related command (PCHCMD) and processing circuitry for decoding the player controller related command (PCHCMD) to identify a controller related operation to be performed with said video game control signals and for controlling the performance of said controller related operation. A peripheral processing subsystem according to claim 9, wherein the processing circuitry includes a microprocessor (250) and an interface controller (284). A peripheral processing subsystem according to claim 10, wherein the interface controller (284) controls the reading and writing of player controller related data from and to the random access memory (264). A peripheral subsystem according to any one of claims 8 to 11, further including a second interface (250, 266, 272, 278, 280) for receiving player controller related data from the at least one player controller (56) and for loading this data in the read / write memory (264). A peripheral subsystem according to any one of claims 9 to 12, further including a boot ROM (262)for storing instructions (IPL) to be executed prior to instructions being executed which are stored in external memory (300), and wherein the processing circuitry is operable to access a boot ROM instruction (IPL) and couple this instruction to the coprocessor (200) upon decoding a command for reading from the boot ROM (262). A peripheral subsystem according to claim 13, wherein the boot ROM instruction (IPL) is accessed from the boot ROM (262) and coupled to the shift register (282). A peripheral subsystem (138) according to any one of claims 9 to 14, further including a serial bus coupled to the shift register (282) for serially providing the player controller related command (PCHCMD) to the shift register (282), a timing bus coupled to the shift register (282) for providing timing signals (PCHCLK) for clocking the player controller related command (PCHCMD) into the shift register (282). A peripheral processing subsystem (138) according to any one of claims 9 to 15, wherein the shift register (282) is operable as a serial to parallel converter. A peripheral processing subsystem (138) according to claim 9 further including a boot ROM (262) for storing instructions (IPL) to be executed prior to prior to instructions being executed which are stored in external memory (300), and means for accessing information from one of the random access memory (264) and the boot ROM (262) in response to the decoding of the player controller related command (PCHCMD). A peripheral processing subsystem (138) according to claim 17, further including a player controller input interface controller (284) for receiving player controller data from the player controllers (56) and for transferring the player controller data to the random access memory (264). A peripheral processing subsystem (138) according to claim 18, further including at least one register (292), a buffer storage device (312) coupled to said register (292) and a serial to parallel converter (314) coupled to said buffer storage device (312). A peripheral processing subsystem (138) according to claim 9, wherein the processing circuitry is responsive to a predetermined player controller related command (PCHCMD) 1) for retrieving data from a player controller and loading such player controller data into the random access memory (264), and 2) for reading data retrieved from random access memory (264) and forwarding the retrieved data to the first interface circuit (260) for transmission to the coprocessor (200). A peripheral processing subsystem (138) according to claim 20, further including a second interface circuit (250, 266, 272, 278, 280) for temporarily storing player controller data received from said player controller and for coupling said temporarily stored data to said random access memory (264) under the control of said processing circuitry. A peripheral processing subsystem (138) according to any one of claims 7 to 21, farther including a memory device (252) for storing a first set of instructions for controlling the performance of the operation relating to the video game control signals identified by the player controller related command (PCHCMD) and a second set of instructions for authenticating the external memory (54); and a microprocessor (250) for executing the first and second sets of instructions. the game system (50) also comprises a peripheral processing subsystem (138), coupled to said coprocessor (200), and operable to receive said player controller related command (PCHCMD) and for executing said command to thereby perform said operation relating to said video game control signals. readout circuitry (370, 354) for coupling information readout of said memory media to said multiplexed bus. A portable storage device (54) in accordance with claim 24, wherein the signals transmitted across said multiplexed bus have a plurality of timing parameters (t) and at least some of the parameters are programmable. A portable storage device (54) in accordance with claim 24, wherein said memory media (76, 77) occupies a first address domain in the address space of said game microprocessor and wherein the signals transmitted across said multiplexed bus have a plurality of timing parameters (t) and at least some of the timing parameters are programmable based upon said media being located in said first address domain instead of a second address domain. A portable storage device in accordance with any one of claims 24 to 26, wherein said multiplexed bus further includes at least one address latching enable control line. A portable storage device in accordance with claim 27, further including at least one register (352) for receiving address information transmitted over said multiplexed bus in response to a control signal transmitted over said at least one address latching enable control line. A portable storage device (54) in accordance with claim 24, wherein said video game console (52) includes a video digital to analog converter (144) which generates a composite synchronization signal and wherein said portable storage device (54) includes an input terminal for receiving said composite synchronization signal. A portable storage device (54) in accordance with claim 24, wherein said portable storage device (54) includes at least one interrupt related terminal. the readout circuitry (354, 370) is responsive to said memory media enable related signal, thereby to read information out of a memory media location identified by said address signals for coupling to the bus. A portable storage device (54) in accordance with claim 24, wherein said portable storage device (54) further includes a memory media authenticating processor (152) for transmitting and receiving information to and from said video game system console.